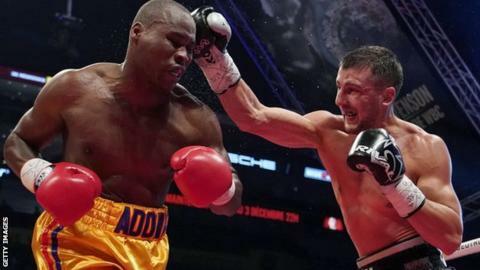 Unbeaten Oleksandr Gvozdyk retained his WBC light-heavyweight title in his first fight since leaving Adonis Stevenson in a coma. Ukrainian Gvozdyk, 31, won by technical knockout in the fifth round when Doudou Ngumbu suffered a leg injury. The Congolese-born French fighter had limped to his corner at the 2300 Arena in South Philadelphia, USA before the referee ended the contest. Stevenson suffered a "severe traumatic brain injury" in their December bout. The 41-year-old Canadian had been boxing's oldest and longest-reigning champion before an 11th-round knockout ended his career. Stevenson had emergency brain surgery and has been learning to walk and speak again, his fiance Simone 'Sisi' God told the Los Angeles Times in February. "He's doing so great. I feel he's going to make a 100% recovery - something usually not seen following such a traumatic brain injury," she said. Elsewhere on Saturday, Puerto Rico's Angel Acosta saw off Mexican challenger Ganigan Lopez to retain his WBO world light-flyweight title. It was the 28-year-old's third title defence since taking the belt in 2017. Geovana Peres followed in the footsteps of Joseph Parker to become New Zealand's second WBO world champion as she beat compatriot Lani Daniels in Auckland to take the vacant light-heavyweight title. And Argentine Daniela Romina Bermudez defended her WBO bantamweight world title against Irma Garcia of Mexico in Buenos Aires.